Well, I did say I would post the rules for Bingo today, so here they are, just for you. Round 1, will be one line, either horizontal, vertical or diagonal. Round 2 will a T, either top or bottom. Round 3 will be an X. Round 4 will be an H, either horizontal or vertical. Round 5 will be a Blackout or Full card. Prizes: For all of the rounds in this Bingo game, the prize will be an Electronic Gift Certificate to one of the many stamping companies we all know and love. You will find out on Wednesday what the first company will be. Be sure to hang onto a clean copy of your card, because the game board resets each round. You must email me or comment on a post stating that you are the first to have Bingo, T, X, H or Blackout, to claim your prize. All claims will be verified against my master list. Once someone has won in any given category, that category is no longer active and we will clear the Bingo cards (put all the numbers back in the pot) and start the game again until we have a winner in each category. I will call (post) a new number each day starting Wednesday January 2nd. I will also maintain a master post with all called numbers for the current round in case you get behind or start late. If you want to speed up the bingo calling, just enter a card in the contest. Make a card using a card sketch of your choice. Post a link to your card, and where you found the card sketch, be it SCS or one of the many bloggers who post card sketches on their blogs in the comments section. For every card entered, I will add an extra bingo number. 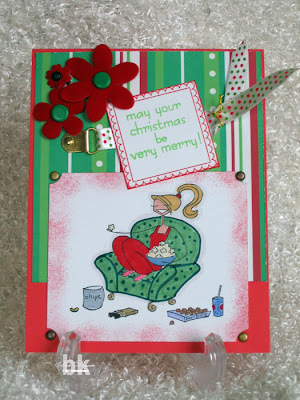 So, for Round 1, the challenge will be to make a card using stamps by Stampin’ Up. This is such a well known company, I think most people have at least one stamp in their stash. You can use any sketch, any colour combo, any technique you want. 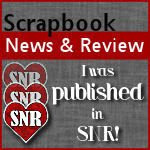 Remember to post a comment, with a link to your card, whether it be on your blog or in SCS gallery or one of the many free albums available on the web, it doesn’t matter. For every card that is presented, I will call an extra number, beginning on Wednesday, January 2nd, 2008. If you submit a card, but it doesn’t show up in the numbers called the next day, I probably received it too late, but it will go into the next day’s numbers called. This post will remain here until Wednesday, when Round 1 will begin. Have a great New Year, everyone. Last night I received an e-mail from Jessica Lynn of Jessica Lynn Original and was asked if I would like to join the Design Team. I was super excited, grabbed my hubby and gave him a big smackeroo! After calming down a little, I was able to explain to him what this meant to me. Needless to say, he was very excited for me as well. Jessica Lynn Original is a fairly new company and she has the sweetest designs. They are whimsical, playful and look like a joy to work with. I found her site through a comment she left on my blog and immediately went to look. I ordered some Dragon stamps. 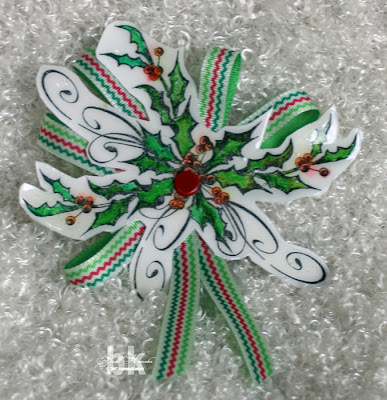 They are expected to arrive in a day or two because the Christmas mail has slowed everything down. They're not the ones I'll be working with on the Design Team, you'll have to wait to find out what they are, but I know you won't be disappointed. So for now, hop on over to Jessica Lynn Original and take a peek, better yet, order some stamps. I've also added a link on the right side of the page. I've admired that title, "Design Team Member" on so many other blogs and I am proud to display mine now, too! Thanks Jessica for a wonderful opportunity. I won't let you down! The colours for BCC07 make for a great Happy New Year card! And WinoBella is just the babe to say it. These Bella cards have been so fun to make and I've enjoyed myself thoroughly this past week, so thank you to the ladies responsible for these challenges. I think Katie, aka scrapper79, did the colour challenges and Jamie, aka jaymerz, did the sketch challenges. Very talented ladies indeed. You should c'mon over to my blog and join the Bingo game starting on January 2nd and, hopefully, I can give back to you some of the joy you've given to me with these challenges. Let me also mention that the sentiment, Happy New Year, was part of the great deal of 10 extra free stamps from Gina K. Designs when she opened her new store. Thanks, Gina, it was just the thing for this card! Okay, that's it except for one more wonderful thing that has happened to me, but I'm not telling in this post. It deserves a separate post all by itself, so stay tuned! I'm getting closer to completing the Bella Challenges! I must have them done before Dec. 30th, as I want to post rules and challenges of my own for the upcoming Bingo game. See post about Bingo here. 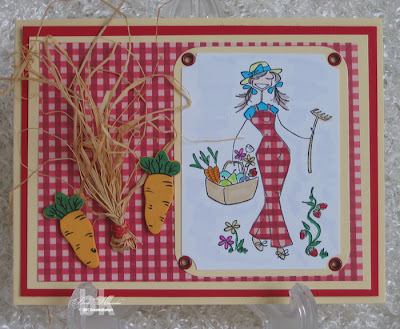 This lovely Bella card is for challenges BSC05 and BCC03. As you can see, there is a plethora of colours involved in this card. At first, I thought how in the world will all these colours work together, but, the creator of this particular challenge obviously knows what she's doing because, look, it's great. Sorry, my modesty left me during four births and has never returned. LOL! Don't you just love BarBella. She's strong and, when the going gets tough, she'll be there for you. The sentiment is from Punchy Words by Gina K. Designs. BarBella is stamped on shimmery white cardstock. I don't use the Spiral Punch by SU as often as I should, but I thought it worked well on this card. Next up is my card for challenges BSC01 and BCC06. For this card I used ChefaBella. I'm going to send it to my daughter, Tiffany, as thank you card for our Christmas gift. She ordered us a Christmas Dinner for four to be delivered Christmas Eve. I was so grateful because standing and cooking meals are very difficult for me right now. I'm having both knees replaced soon, February, I hope, so standing and walking is painful. I thought Christmas Dinner was going to be hot dogs and frozen fries until Tiff told me to expect a special delivery. So, in my opinion, she's the "Chef-of-the-Year". 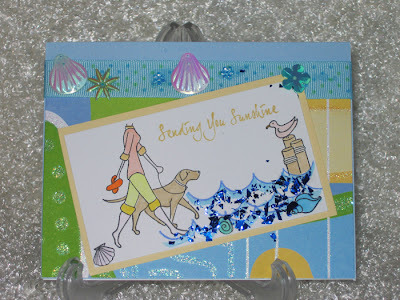 The other stamps I used came from Crafty Secrets, another Member Company on SCS. It's the Kitchen Classics set which you can see here. Well, that's me done for today. I'll be busy on my last card later and will post it tomorrow. Have a great day, all! The card base is Kraft cardstock. On top of that I layered some Certainly Celery, Soft Sky and some DP of unknown origin. Then I wrapped some ribbon in the same soft colours and over that I mounted my image of the cute little darlin' baby. The image was double-matted using the same colours. Believe it or not, I used the ticket punch on the corners of the white and blue bits and the corner-rounder on the green. My hard work didn't show up after I added the darling little onsies brads. I stamped the sentiment, also Stamping Bella, onto blue and mounted it onto the green and attached it with a itsy bitsy safety pin with a blue head. It's attached to the card with glue dots to give it some dimension. 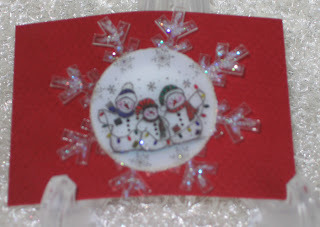 And no Bella card is complete without a little bling, so I used Stickles on the onsies brads. There you go! ETA: I can't believe I forgot to say this card is for the Bella Challenges and is based on these two challenges: BSC06 and BCC08 I am so sorry to have forgotten to give credit for these colours and this sketch to the proper people. I'll remember in future, I promise. According to Jamie at SCS, there's something special going on with the Bella Challenges. I'm locked away in my craft room (except for posting here) trying madly to catch up. If there's something to be won, baby I want a crack at it! This first card covers challenges BSC07 and BCC04. Jamie said it was alright to combine the challenges and I'm so glad, otherwise I may not be able to catch up. You likey my GlobetrottaBella. She travels everywhere, in fact, she just came back from Cuba where she attended a very important wedding. LOL! Next, we have VeggieBella for challenges BSC08 and BCC05. I lovee this card. Maybe it's the raffia that I lovee so muchee, but whatever it is, me likey! Would somebody please make me stop talking like that! It's very catching if you read Emily's blog on a regular basis. Okay, that's all I have time for right now, but I'll be back with more challenge cards later today, or tomorrow. Shopping, did somebody say shopping! Yes, somebody did, indeed, say shopping. In fact, it was the lovely ladies at Papertake Weekly Challenge and they want you to "Shop 'til you drop" cards. Here's my entry for this challenge. Of course, it's none other that Retail Fellabella from our own Stamping Bella. I just can't imagine where he'd rather be.....but, there's just no understanding some men. Am I right, ladies? I found some cute little hat charms in my stash and thought the Bella should be wearing a hat, so I plunked one on her head. 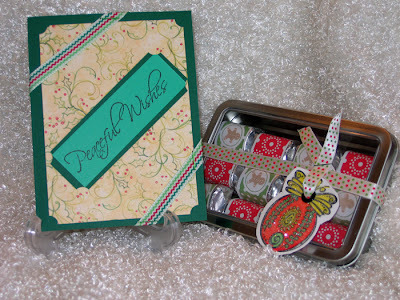 The little metal pressies were part of the same stash and were perfect for this card. The boxes he's holding were coloured with glitter pens and the main image coloured with Copic Markers, Set C. I love them. The design of the card I must admit I copied from A Day in the Life of Gina K. I just fell in love with this layout and you'll be seeing it over and over again, I'm sure. Don't forget to check the post below this one if you want to play BINGO. The new game starts next Wednesday, January 2nd, 2008. Bye for now! I had so much fun playing BINGO in the summer, I thought I'd do it again. So, I have 40 cards and that means 40 places. If you played before, I know which card you had so you WILL NOT get the same card again. All you have to do is send me an e-mail with BINGO in the subject line so that I don't miss it. I will send you a card and the game will begin on January 2nd, 2008. Remember, only 40 places, so sign up early. I'll post the rules on January 1st for all to see. Making little gifts is great! I spent the morning making a couple of Christmas gifts. This one I made for the postman. He knows that I have trouble walking and carrying things and very often there will be a knock on my door and there he is, personally delivering my mail. This goes way above his job description as we have the little post boxes at the end of our street and that is where we collect our mail. He doesn't have to do this but I am so thankful that he will bring the heavier parcels to my door and I wanted to show my appreciation. This gift is for Nicole. She is the lady that comes to the house every other week to do some housecleaning for us. She also does more than required and has been known to change a lightbulb or take my recyclables to the end of the driveway for us. Not only does Nicole make my house shiny and clean, she is pleasant company and chats away while working. Makes Tuesday afternoons very pleasant. This is my way of saying thank you to two of my favourite people. From one furry friend to another. Okay, you guessed it. I'm nuts for dog stamps at the moment. Where will it end? I don't know. What I do know is that they certainly come in handy when our furry friends want to be friends with other furry friends. It just makes card giving so much easier. This card is going to, well, I won't say here, but I'm sure it will be appreciated. 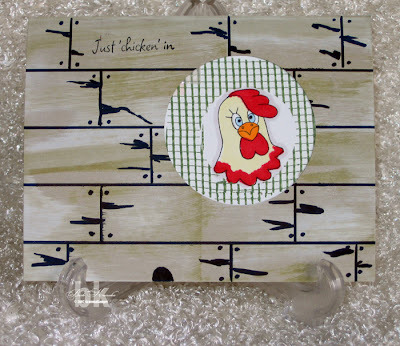 I used one of the stamps from the Carolyn King Collection offered by Gina K. Designs. And, of course, coloured it with the Copic/Ciao markers. I'm looking forward to a darker shade of brown for my dogs soon. I started with some kraft cardstock and added a layer of Mellow DP by Basic Grey. Then, I used the large Nestabilities scalloped circle and the second-largest regular circle. I purchased my Nestabilities from Scrappin' Great Deals and I'm lovin' them. I think the rectangles will be the next ones to get. For the sentiment, I used the ticket punch by SU on the left side only and added a couple of square brads by MM. A few paw prints from Pink Cat Studio and a bone brad in the dogs mouth and called it done. It's going out in the mail on Monday morning, so someone who reads my blog needs to watch for it. ....of Copic Marker users. I just received my first set of 36 Copic/Ciao markers. I chose Set C because I love pastels and I'm very pleased with their colours. Here's a couple of cards I made using my new markers. The top card uses one of my stamps from Elzybells. 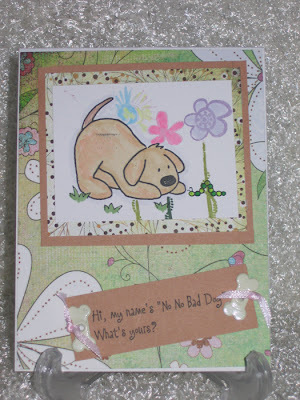 I stamped the dog first, then masked it, and stamped the flowers. They are a clear set I received from Michelle for the blog candy I won. Thanks, Michelle. I coloured in the dog and flowers using my new Copic/Ciao markers. Boy, do I know now what everyone is raving about. I immediately called Gina K. Designs and joined the Copic Marker club. I literally said I didn't care which group I joined, except for Set C group, I just wanted to get in a group. I was able to get a spot in the group for Set D. It's a great way of getting the markers at a price that is affordable by agreeing to a six-month duration. Each month, group members will receive six markers from their chosen set and, in the sixth month, you will also receive the case for the markers. Great idea, Gina, I love it. I feel very lucky to have a spot as the original sign-up occurred while I was at my son's wedding in Cuba. The bottom card was made using my very first My Favorite Things stamp set. It was the November Stamp of the Month set and I loved it. MFT is also where I purchased the Copic/Ciao markers. Don't you just love the softness of the colours. I love Copic markers. Anyway, back to the card. For embellishments, I added some little pearlized shells and flowers I had in my stash. I have no idea where I got them or who makes them, but they are sweet and just perfect for this project. Also in my stash was a little bag of blue, glitter bits, again, from where I know not! I used my glue stick over the waves and threw on the glitter bits. Worked quite well, I think. 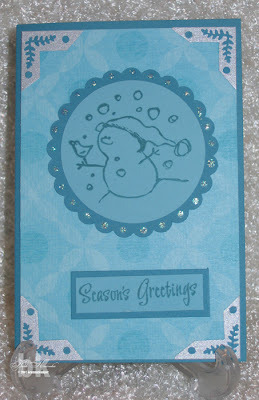 The cardstock is PTI Select White to which I added a piece of DP from my Glitter Stack. I think I'm going to go shopping again at MFT. I really like their stamps. My DH was very observant when I showed him my creation. He said, "She doesn't have a head!". I wish more husbands were as observant (spoken tongue-in-cheek fashion). LOL! I'm pleased to say that my Christmas cards are now all done and waiting for me to take them to the Post Office which I will do when it stops snowing. It most likely will be tomorrow and then they'll be on their way. This morning when I got up I didn't even make a pot of coffee. I just downed some orange juice with my daily meds for hypertension and arthritus and went straight to my craft room where I finished making 22 more cards. Then, as DH is home now, I asked him to help me put the labels on the envies and stuff them and, before we knew it, they were done. After that I came into the computer room and finished my first week's lesson from Big Picture Scrapbooking. It's a digital class on the use of brushes in Photoshop. It's good for Photoshop CS3 (the program I use) and Photoshop Elements. Here is the finished page. 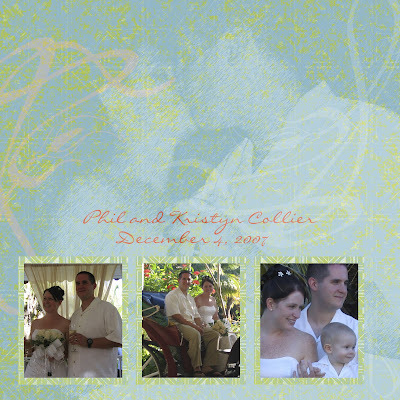 It is 6 x 6 and I may have it professionally printed and then framed for Phil and Kristyn for a wedding gift. What do you think? Now it's time to kick back and relax a little. I'm going to turn on the fireplace and put on a movie. I'll be back with more stuff tomorrow. See you then and thanks for stopping by. Just recently I participated in a Christmas Pin swap at The Stamp Shack. There were about 10 or 12 participants and we were paired up and exchanged pins with our partner. I had never made a pin before and had loads of questions. It turns out that lots of people start with dominoes, or that paper that shrinks when it's heated. Well, I went merrily on my way and did what I thought would make a nice pin. Here's the pic of the pin I made. This is how I created this pin. First, I stamped the ivy leaves, by Stempleglede and coloured them in using my Prismacolor Markers. Then I cut the stamp out and laid it on a bit of waxed paper. I literally poured Glossy Accents all over it and prayed that it would dry in 2 - 3 days as it was so thick, without warping the cardstock. YAY! It dried perfectly and lifted off the paper beautifully. Next, I used a chipboard circle and punched it with my Crop-A-Dile and then inserted the large red brad through the cut out image and the chipboard. It looked okay, but needed something more. That's when I grabbed my ribbon and cut five strips. I looped them over and adhered them to the back of the chipboard circle. Then I attached a second chipboard circle with some really tough glue. To that, I attached a pin backing, packed it very carefully and sent it off to my partner, Mary. It was a really fun swap to do and these are the pins I received from Mary. She had made two and couldn't decided which to send, so I got both of them. Thank you so much, Mary. The pins are lovely and I will wear them, one on each winter coat I own. Finally, some play time for me! My DD brought me my new Elzybells stamps and I wanted to ink them up as soon as possible. The first one is for Poetic Artistry's Mojo Monday #15. It's a cute sketch and I thought it would work well with this little fellow. I did some paper piecing on the balloon for interest. Also, I stamped some little dog items, also from Elzybells, on the cross piece. While you can't really see them well, they are a dog dish, a slipper and a dog collar. The little paw prints are by Pink Cat Studio. I used some Caramel Fun Flock on the dog's body, but not his face as it would have covered up his eyes, nose and mouth which are just to cute to cover. Then, I mixed some white and blue Fun Flock and just dabbed by glue pen in hopes it would look like clouds. I added some Prima flowers and dog bone brads from Archivers. Hope you like it. This is also a Poetic Artistry sketch, but it was for last Monday. I really liked it so thought I would use it even though it's too late to be entered, but that's okay by me. Sketches are necessary to me so when I see one I like, I take advantage of it. This is going to be sent to the Mom of one of my Shackie friends who is recovering from a nasty little bug. I hope he makes her feel better. 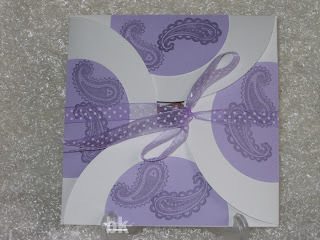 For this card I started with Cool Caribbean cardstock, added a little Petals & Paisleys DP by SU. I left the mat a little larger on the right-hand side where I placed my ribbon. 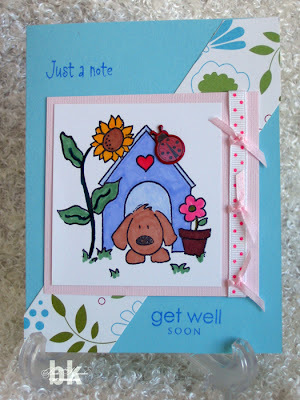 The 'just a note' is by Elzybells and the 'get well soon' is from PTI's Little Lady set. And that's all there is to this card. I hope Tami's Mom likes it. 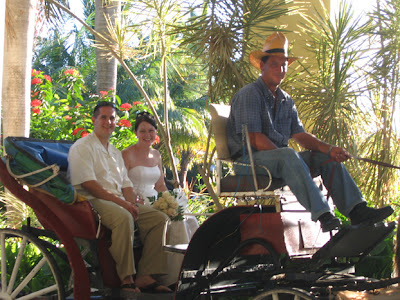 And ready to report on the wedding and my week in Cuba, along with a few pics. 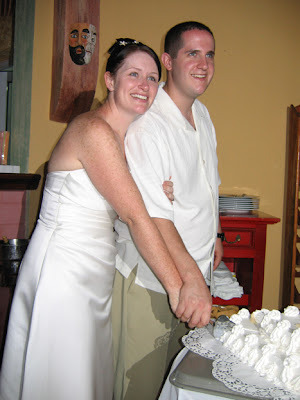 First, let me show off my son, Phil and his lovely bride, Kristyn. Aren't they a gorgeous couple? Kristyn was absolutely beautiful and Phil looked so handsome. I was so proud of them both I was near bursting. 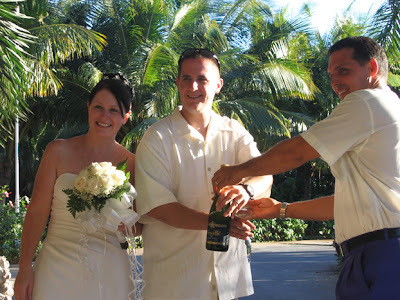 The first pic was just after the ceremony which took place in a lovely gazebo on the resort grounds. The staff decorated it beautifully with sheer, billowing curtain panels gathered and tied in the middle and the chairs were covered in the same material. 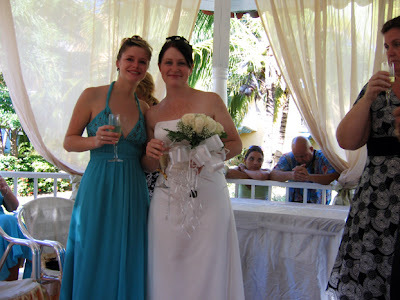 Here's a picture of Kristyn with her sister, Kelly, her maid of honour. Kelly's dress was a gorgeous blue, just right for a beach wedding. The young woman on the right side of the picture is my DD, Tiffany. Tiff was a great help all week with looking after the two grandsons, Owen and Jackson. At 16 months and 17 months, those little guys never stop! I had totally forgotten how active they can be at that age. I'm glad there were 22 other people in our party to help out the parents. When there's water around you can't have too many eyes keeping watch! 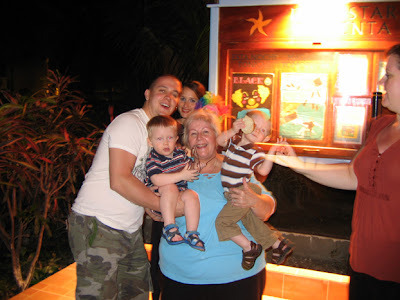 Here's a pic of the two boys with me, Grandma. My DS, Andrew, is helping me to hold Owen. And, once again, Tiffany (on the right of the picture) is there giving Jackson a cookie and standing guard in case I need help hanging onto the babies. I just loved having them around all week to watch them play together. Owen (on the left) has now returned home to England with his Mom & Dad (my DD Kirsten and DSIL, John) and Jackson (on the right) is at home with Phil and Kristyn (the newlyweds). Do I look ecstatic or what? I'll end this post here as I think it's long enough for now. I will post more pics later, but I've got to get into my craft room. After 12 days away, I'm anxious to get back to playing. See you soon. I will send a handmade gift to the first 3 people who leave a comment on this post requesting to join this Pay it forward exchange. I don’t know what that gift will be yet and you may not receive it next week, but you will receive it after the New Year. The only thing you have to do in return is pay it forward by making the same promise on your blog. So basically, if you comment, you’re on. I’ll send you something crafty that I’ll make for you. Once you sign up, copy and paste the above paragraph on your blog, and three other lucky people will be recipients of your handmade work. I got mine from Lesa here. This is a terrific idea an it will certainly start off the New Year in a most positive way. This will be my last posting until I return from vacation on December 9th. If the hotel has internet access, I may be able to show pics of the wedding, but I don't know until I get there. About 20 of my family are all heading to Cayo Coco, Cuba for DS's wedding on December 4th and I'm so excited to have 12 days with my kids and grandbabies, sister, friends, and I'm just plain excited. ....I just had to play! My sister didn't like the invitation for her party that I made earlier. She said it was too "cutesy", so I made her another one. Only in a sister would I allow someone to get away with dissin' one of my cards, but she is very, very picky so..... Anyway, this is the new design and if this one doesn't fit, well, there's always Hallmark, ya know. With that invitation done, I went on to the Black Friday Bonus Challenge at SCS. I had a little fun with this as we had to use a non-Christmas Bella stamp. As you can see, I chose PMSaBella. I like to think she's stringing popcorn for the tree on Christmas Eve. The sentiment is from a Special Collector's Edition from Hero Arts Clear Stamps. I received these when I attended one of their classes at Archiver's Scrapfest at the MOA last September. Okay, that's it for now. The dryer has just buzzed me and I must answer so I can start packing. I need everything to be in its place before I can begin the chore of packing. Are you like that? 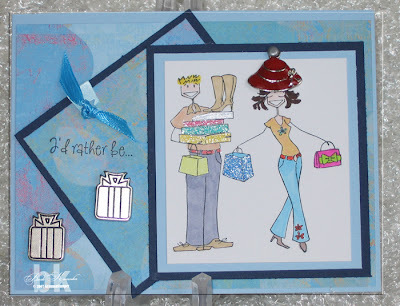 I am in love with all my new Gina K. Designs stamp sets, but Way To Go is perfect for birthday cards for my family. This one is for my brother, Bob. I'll be seeing him next Wednesday evening, just before I leave for Cuba for DS' wedding, so I want to give it to Bob then. The only image that is not Gina K. is the picture. 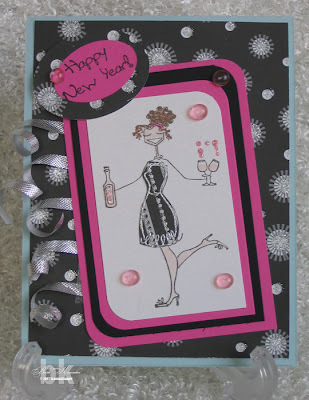 That is from Pink Cat Studio and I think it just adds that little something to the card! I would like to wish all of my US readers a very happy and blessed day. Here's a pic I found on the web and it allowed me to download it. This is where I found it and I hope I'm not breaking any copywrite things. If it's yours, and I am, please let me know and it will be removed immediately. ENJOY YOUR DAY AND "GOBBLE 'TIL YOU WOBBLE"
It's been a few days, but I'm here now! Sorry to everyone who has visited lately and not seen anything new. 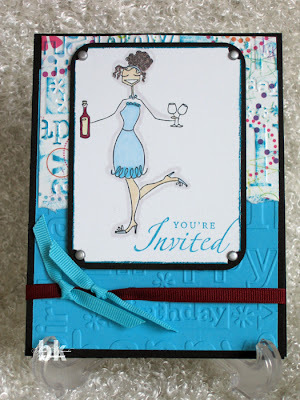 I was waiting for my new Gina K. Designs stamps to arrive. Then, I had to cut four, count 'em, four sets of rubbah! By then, my hands were so sore I had to give them a rest, but I was up bright and early today and ready to play. 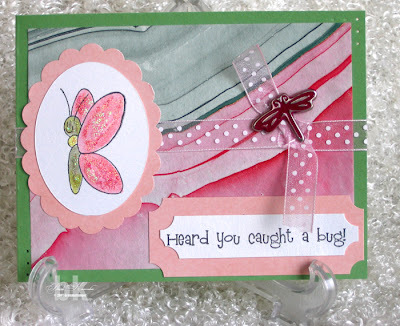 Here's my first card using Gina K. I love the Gettin' Buggy with It set. It also is yesterday's colour challenge CC141 on SCS. This is such a sweet set and I wanted it primarily for making cards for the grandsons. Of course, for them, I'd go more blues, but this works well too. The base is Wild Wasabi and the patterned paper is a scrap from the stash. The pink scalloped oval is also of unknown origin, but I can tell you that the white is a shimmery white and the image is stamped with Black StazOn ink. I coloured it using my SU markers and added a little Stickles to the image. Of course, no card is complete without some ribbon and the little dragonfly brad is keeping the knot from coming undone. A little paper piercing on the corners and it was complete. 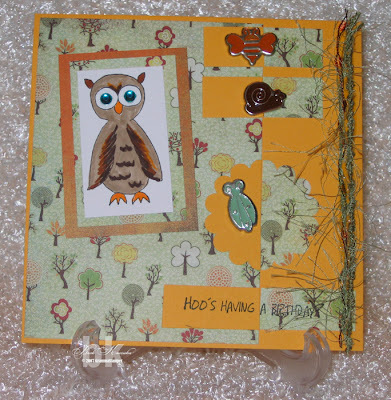 Next up is a card using the owl from the Caroly King Collection from Gina K. Designs. This is the exact same sketch that was used in the Bella card shown here, which was a sketch challenge by The Stamp Shack creative team. I just used different colours and image. The base is Summer Sun, the DP is by Basic Grey and the brads are from Archiver's when I went to MOA in September. I think they're adorable and use them fairly frequently. The fibres add a very dramatic touch, as do the green baubles on the eyes of the owl, don't ya think? 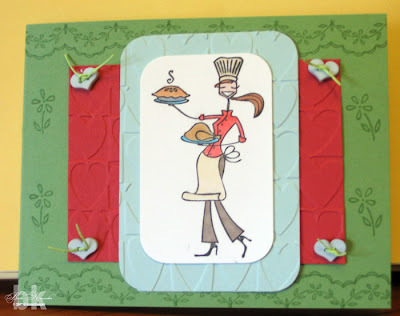 And, last, but not least, is a card for the Stamping Bella forum at SCS. It is BSC04 which you can see here. I turned the sketch onto it's side as I think the wide orientation is much more suited to the Sweetybellas. This was a fun card to make! I purchased the little ice cream cones at Ms last week, knowing they would be perfect for Sweetybellas. They are really buttons and I thought it would be easy to remove the back bit, but alas, that's not the case. They sit very 'proud' on the card and if it had to go in an envelope, it would never survive Canada Post, I can tell you. The base is Certainly Celery, the first, yellow layer is Bazzill. 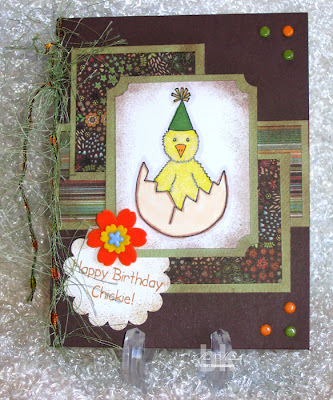 Once again, the patterned paper is from the scrap stash and unknown to me. I coloured the image with Tombow markers and added a little Copper Stickles to the hair of the the left Sweetybella. 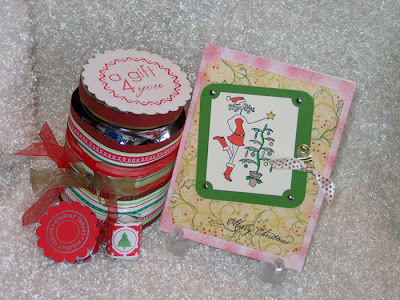 Next came the ribbon and then the Pink Grapefruit baubles, also from Stamping Bella. Very 'sweet', but definitely needs to be hand-delivered! I'm going to be really busy in the next couple of days. I'm leaving on Tuesday for Toronto and then, on Friday, heading out to Cuba. My DH is staying home because he's not able to travel just now, so I've got to make sure there's enough groceries and stuff for him for 12 days. OMG! I'm going to need a truck to bring home the groceries. However, I'll still want to play and when I do, I'll post here for you to see. My first scrapbook page in aeons! These challenges will be a much needed catalyst for me to get back to scrapbooking. With two grandsons now, and another grandchild on the way (WOO HOO! ), I need to get cracking. Just the other day I had some photos printed with the very idea of 'getting down to it' and, well, now I have. As a former CM consultant, I have loads of empty albums so I started with a 12 x 12 CM page. I used River Rock onto which I stamped the pine tree branches, also in River Rock. SSHHH! don't tell anyone! There is a seam very carefully hidden under the photo because I only have 8-1/2 x 11 SU paper. 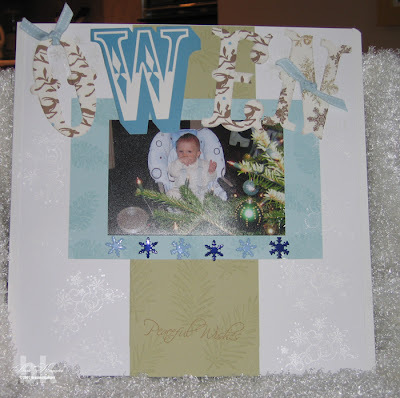 Next, I selected Soft Sky for the photo mat and stamped that with the pine cones, then mounted the photo. Because the white areas looked a little bare now, I pulled out the TAC Snowy Swirls and stamped them in my new Dew Drop ink in Platinum. This colour really shows up well on a white background. I added the snowflake brads and used the letters from My Mind's Eye Christmas Bohemia collection and added a couple of bits of Soft Sky ribbon. I've long wondered what I would used these letters for since they are huge. A scrapbook page is just the ticket. Just to finish it off, I stamped Peaceful Wishes in Palette Hybrid Cognac. Thanks to the Design Divas, Amy Rysavy, Taylor van Bruggen, Nichole Heady, and Lisa Johnson for such great challenges. This is the card I made for the Inspiration Challenge, IC102 - Tapestried Jacket, at SCS today. I saw the jacket and immediately knew the paper I wanted to use. Beleve it or not, but this bit of paper came out of my scrap drawer and perfectly fit the card front, with the butterfly almost smack-dab in the middle. I looked at it and just couldn't bring myself to cover it up with a stamped image. I opted for the little stamps in the Circle of Friendship set by SU and double-matted it onto some coordinating scraps which were punched out with my CM circle punches. 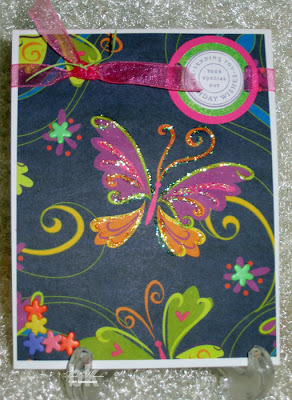 I added the sheer, hot-pink ribbon, some flower brads and just a touch of Crystal Stickles on the butterfly. Inside I stamped something appropriate for birthday. This is the first time I really focussed on the paper and not a stamped image and, I like it. It's no secret that me and sketch challenges are absolutely best friends and this is the card I made for Moralia's Sketchbook Monday. It's a really cool sketch and this is my entry. 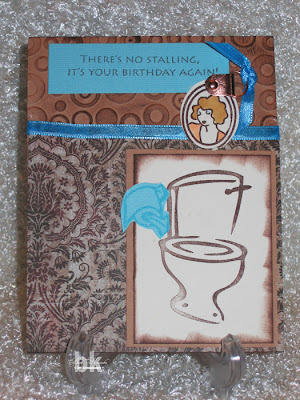 This card is made with the goodies I received from Heather of Ribbons and Ink on a challenge she had a while back. You can check out her blog here and you're sure to find something interesting and informative, I know I always do! The only things not from Heather's goodie package are the photo hangers, which I just received with my order from CTMH, and the ribbon, which came from my stash. So, thank you Heather, and you should look for this card in your mailbox in the very near future. I can't seem to make a card without a sketch to follow. At any rate, this card is for the monthly sketch challenge at The Stamp Shack. I am loving this sketch and will use it again in non-Christmas card style. For now, I'm stuck on Christmas and Merrybella. You can see the challenge here. This card is 5" x 5" square. The base is Night of Navy cardstock. The large DP panel is about 3-3/4" x 4-3/4" and the paper is by Reminisce. I carefully pasted little bits of opposing papers for the bars and did the same on the SU Scallop punched out bit. Then I stamped Merrybella onto some PTI Select White cardstock, and matted it with some DP and more Night of Navy. The brads and snowflake were added, but I thought it was still missing something. 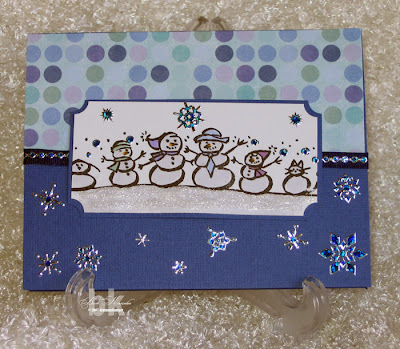 Out came the TAC snowflakes and I stamped them using my new Dew Drop Brilliance inks in Platinum. I even stamped them on the white cardstock and they actually show up in the pic. Of course, no Christmas card of mine is complete without the addition of Stickles and, in this case, I used Crystal Stickles. All in all, I'm pleased with the way this turned out and I hope you are, too! You can just barely see the sentiment at the top, but it says, simply, (MWAH KISSES), which is a very favourite phrase of Em's. I put some Perfect Puff on the icing, sprinkled it with Martha Stewart Glitter and then heated it up to make it puffy so that it would look more like icing. The cherry on the top is actually a pink brad with a heart in the middle. Missed Mojo Monday last week, but not this week! I love playing Julee's Mojo Monday sketches at Poetic Artistry, but I missed it last week. So, I'm making up for it by getting Mojo11 done early, for me, at least. Also, I'm trying to make up for so few posts the last couple of days. Here's my card for today. This is a terrific sketch by Julee and I loved completing this card. I'm starting to learn that the best cards I see have huge attention to detail and I'm going to try to drill that into my head. As in all things, whether it be decorating a room, sewing a quilt or cooking a fancy meal, the appeal is in the details. I started off by choosing a stamp that hasn't been inked before and Lord knows I have plenty of them. I chose this chick from Gina K. Designs "Caroline King Collection". This stamp is so versatile and can be used for birthdays from 1 to 100 and beyond! 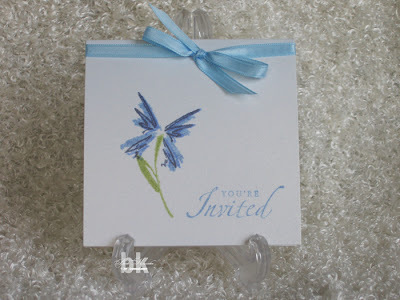 After choosing the stamp, I carefully selected by DP and from that, can the choice of cardstock. I coloured in the image using Prismacolor Markers. On the yellow chickie, I used a glue pen and then covered it in White Fun Flock to give it that 'newly-hatched' chick feel. You'll just have to take my word for it, it does, indeed, feel soft and fluffy! After following the sketch, I added some embellishments in the form of brads in the corners, the sentiment which fits perfectly on the SU scalloped punch and added the velvet flowers and some awesom fibres I received in a prize package from The Stamp Shack. The velvet flowers are orange and yellow with a tiny blue brad in the centre because there is some blue in the DP and I wanted to pick that up. All of the edges of the green and white cardstock have been sponged with a dark brown chalk ink for added depth. Actually, it was a visit from my brother that I am going to blame my lack of posts on since last Wednesday or Thursday. George was on his way from Calgary to Ottawa (where he lives) and stopped by for an over night visit last Thursday. That meant I had to clean up my scrap room and remove the myriad boxes that piled up on the bed, along with a ton of other cardmaking/scrapbooking items too numerous to mention. After all, he needed the bed to sleep in, right? When I was finished cleaning, I was so impressed with it I actually took pictures to remind me what a tidy craft room looks like. Then George arrived and we had a wonderful evening (read too much wine and beer) and Friday was a day of suffering just a lil' bit. It took me a couple of days to want to go in there and start messing it up again, but finally, last night around 10 p.m. the urge to make a card overcame me. This little House Mouse, Muzzie, I think, is the result. I would like to thank Christie from The Stamp Shack for sending so many HM images to me. I started with Real Red c/s and then layered some textured light blue c/s of unknown origin. It feels very much like Prism paper, but I can't be sure. Then I used my SU scalloped punch which was exactly the right size for this particular image. Out came the Marvy Giga scalloped punch for the DP (also unknown origin). After colouring Muzzie with Prismacolor Pencils and putting it on the larger scalloped circle, I then placed it on some red Mulberry paper, and went around it with a wet paintbursh which makes tearing it apart easy and leaves a beautiful fuzzy edge. It looked a little plain so out came the embellishments and I went a little crazy with them. First I added some gold brads to the photo corners, then the bright idea of "Merry Christmas" hit me so I added the little beaded letters. Then, as I looked at the card I felt the upper right corner looked a little bare and added the beautiful velvet flower from my Maya Road stash. A little bit of Ice Stickles in Artic Blue for sparkle and it was done. I have a little task for you all if you're interested. I'm going to post the same card below, but it is a "staged" photo. Tell me which you like best, staged or plain. I'm starting a file for staged photos, then if I ever get up enough nerve to submit my cards for DT calls, I'll have some ready to go. This is the Blog Candy giveaway for 20,000 hits. Cindi, look for this in your mailbox soon. It will be in the mail today or tomorrow morning. Please send an e-mail to stampingramma@tbaytel.net with your address. Because I cannot track you from your comment, I must have this within 24 hours, please. If not, I will have to draw another winner. 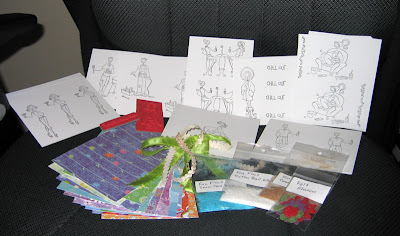 You will love the goody package I have put together and I will post a pic tomorrow, I promise. Thanks to everyone for playing and BTW, I surpassed the 20,000K mark at 9:50 p.m. on Nov. 5th. Onwards to 50,000K now! No card today, but you're gonna love this! I've been running around like a chicken with my head cut off today. I'm leaving for Cuba in a couple of weeks and the errands have begun. So, no crafting today, but this story was waiting for me when I got home and I just had to share. After all, art comes in all forms, right? It's only seems long because of all the double spacing, but please, read to the end. You'll be glad you did! lizards he holds prisoner in his room. serious, Dad. Can you help?" immediately knew what to do. want them to reproduce," I said accusingly to my wife. voice, while gritting my teeth). know," she informed me (Again with the sarcasm!). "Kids, this is going to be a wondrous experience,"
the foot when it next appeared, giving it a gentle tug. the vet with my son holding the cage in his lap. is of her womb, for G~d's sake.). peered at the little animal through a magnifying glass. "Oh, very interesting," he murmured. "Mr. and Mrs.
Cameron, may I speak to you privately for a moment?" in labor. In fact, that isn't EVER going to happen. .
"So, Ernie's just just . . . excited," my wife offered. "Exactly," the vet replied , relieved that we understood. giggle. And giggle. And then even laugh loudly. the upcoming affront to my flawless manliness. Tears were now running down her face. "It's just .that . . I'm picturing you pulling on its . . . its. . . teeny little . . "
the car.. He was glad everything was going to be okay. "I know Ernie's really thankful for what you did, Dad,"
Here are my works of art for today. Firstly, Snowbunnybella arrived home yesterday just covered in snow, of course. 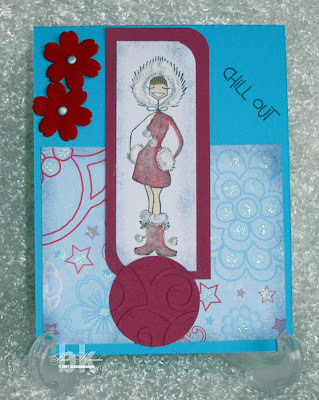 This card is actually for BSC01 sketch challenge at SCS, on the Stamping Bella forum. 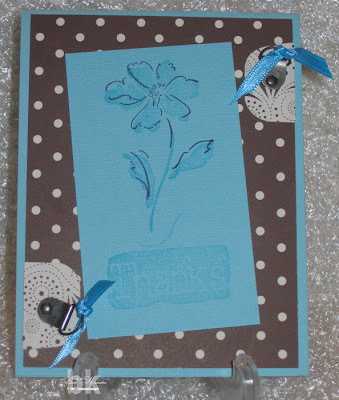 The card base is Tempting Turquoise to which has been added some designer paper from the Pocketful of Posies Mat Stack. I stamped Snowbunnybella onto some white c/s and coloured her with Prismacolour Markers. Her coat and boots are Tuscan Red and the furry bits are Brick White. I went over the coat and boots with my glue pen and dusted on some White Fun Flock and brushed it off for a Faux Suede look. You can see this technique at Papermonkey, where I first saw it yesterday. Great technique! Perfect Puff was added to the furry bits and heated up with the embossing heat gun to make it, well, puffy! I finished it off with some Maya Road velvet flowers and silver brads. Oh, you may also notice some stippling around the edges of the white c/s and the designer paper. It was done with Night of Navy ink and a stipple brush. 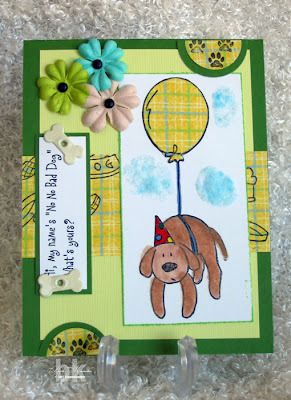 Next up for your viewing pleasure is a card for my friend, Lesa. She is fighting a huge battle with breast cancer just now and I want her to know I'm 'chicken in' with her to see how she's doing. What a fabulous lady and, if you like, you can read about her progress on her blog. As you can see, the card front was made to look like a barn, at least that was the intention. 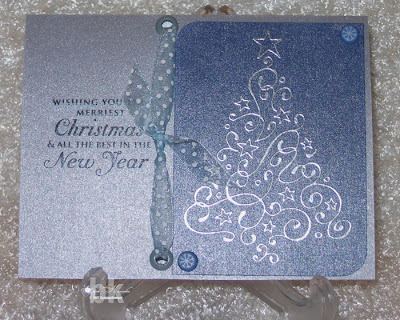 To do this, take a light colour c/s (I used River Rock) and swipe the white craft ink all across the card front. When that dries, swipe the same colour ink all across the card front. Again, I used River Rock. Then, with a ruler and black marker, draw in the horizontal lines. Make sure you offset the vertical lines to look like boards. Then free hand the nails and blotches on the "wood". Very simple and effective. Okay, then I cut out a circle, stamped the image on white c/s, coloured it it and placed the net stuff over it, again cutting out a circle so as the entire image was not covered up. That's all there is to that card and I hope it brings a smile to Lesa's face. .....but it appears to be great for my creativity. I was awake at 4:30 a.m. this morning and went straight to my craft room, no coffee, no OJ, no nuttin' honey! Besides being cold because we keep the door shut so our cat, Hank, doesn't eat scraps and ribbon, but not even that affected me adversely. I made two cards that I think are pretty good. Here's the first one. 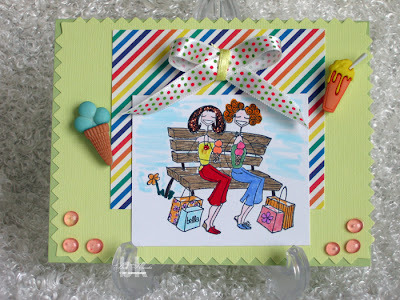 The idea for this card came from a newly published Canadian magazine called Simply Cards Today. What a beautiful magazine and it is published by Scrapbook and Cards Today in response to a magazine just showcasing cards. It is beautiful quality and can proudly be displayed on anyone's coffee table, it's that good. This card used a full 12" x 12" sheet of cardstock. I used my Scor-Pal and scored it at 3" and 9", then turned it 1/4 turn to the right and scored again at 3" and 9". This should give you four score marks. Then, cut each corner out. On the remaining four flaps, I used my largest CM circle and the red blade and cut the flap into a half-circle. I did this on each of the flaps. Now it's ready to decorate. Because this is my first attempt, I kept it relatively simple and used my Technique Tuesday Paisley stamps. Then, it was ready to do the inside of the card. 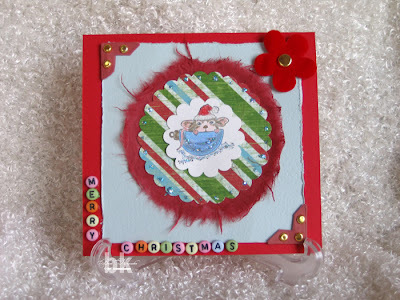 I cut some DSP from a Stampin' Up collection to 5" square and adhered it to the centre of the card. Then I used a 4" square PTI Select White c/s and stamped Getwellabella image there, along witht he sentiment. I coloured her with Prismacolour Markers and that was it. Well, except for the ribbon. To fold it closed, start at the botton and fold one flap up. Next go to the left and fold that up, tucking in a portion of the bottom of the half-circle, then go to the next two flaps and do the same, always tucking a portion of the bottom of the hal-circle in. This makes it stay somewhat closed, but you still need some ribbon. That's it. If you want to see step-by-step directions, leave a comment. If there's enough interest, I will do a tutorial. 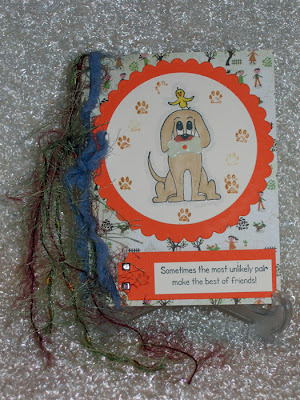 My next card was already half done, as I had the stitched PP left over from my cards for the swap (see post below). I used Chocolate Chip for the card base. 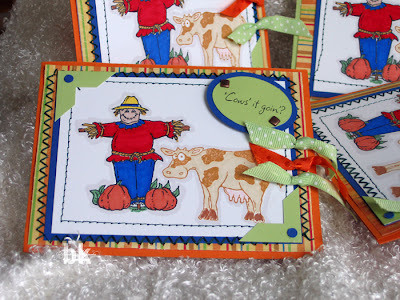 Oh, the idea for this pumpkin also came from the same book as the previous card, Simply Cards Today. As I said, great book. For the pumpkin, I used Only Orange cardstock and randomly stamped the Technique Tuesday Paisley, again. Then, using the middle CM Oval with the red blade, on the inside of the oval, I cut three ovals. I switched to the blue blade and cut two more ovals. After inking the edges of all the ovals in dark brown chalk ink, I placed the three large ovals together, slightly tucking in the ovals on either side. Then I added one each of the small ovals to each side, setting it higher up to give the bottom a rounded look. For the stem, I used a piece of green c/s, the smallest oval and started with the red blade, again on the inside, then without lifting the oval, switched to the blue blade. This created an oval-shaped ring which I cut in half, inked in brown and attached to the underside of the pumpkin. So, these instructions are clear as mud, right? If not, let me know and I'll see if I can clean them up for you, should you be interested. Now I'm tired and need a nap. I'll be back later. Blog Candy for 20,000 hits! I can't believe it! Almost 20K hits since January of this year. I will be offering Blog Candy for this occasion. Leave a comment with the date and time you think surpassing 20K will occur. I'll enter all comments in a draw and use random.org to pick the winner. I'm not sure what the 'candy' will be, but it will include a stamp, some new Bella images, some ribbon and some paper. I'll make up a package in the next day or so and post a pic. I will keep it open until 6:00 p.m. EST, Wednesday, Nov. 7th before selecting the winner. Oh, and I'll post the winner later that evening. Okay, everybody, happy guessing. I see I've been lax about writing here for a few days. I'm sorry and will try to do better. I'm having a slow week in terms of feeling creative, but today, I got kick-started. The Stamping Bella forum at SCS had a colour challenge I just couldn't resist. It's for black and turquoise and I think that combination is gorgeous. I took the opportunity to bundle it up with a design for a birthday invitation which my sister wants me to make for her birthday party. I've now got several samples to show her in a couple of weeks, but this one is probably my favourite. Presenting Winobella. Isn't she adorable? And, to top it off, Winobella is a personal favourite of my sister, so this should be a winner. I added a little burgundy ribbon to represent the wine in the bottle, also a favourite of my sister. The image was coloured with Prismacolour Markers. I finally took the plunge and made a coaster. It's been on my To Do list since last Christmas and I just now got up the courage to give it a go. Let me tell you, it is so easy! I picked up the tile from Home Depot for $.59, a real bargain. Then, after giving it a dusting off with a damp paper towel, I spritzed it to make it wet and dropped on four or five drops of Antique Linen Distress Ink and worked it all over the tile with my damp paper towel. Then, I added two or 3 drops of Walnut Stain (start with light and end with a little bit of dark), again working it all over the tile and into the little crevices. Then I popped it into the oven at 350 degrees for 15 minutes. 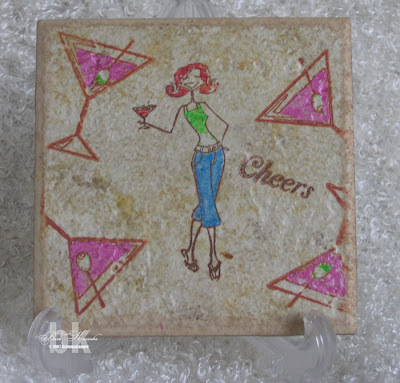 Once cooled, I used ColorBox Chalk ink in the darkest brown to stamp the martini glass and Cosmobella. Again, into the oven for another 15 minutes. While it was cooking and cooling, I spritzed up my Twinkling H20 paints in the colours I selected to get them ready for painting. After painting the images, it was back into the oven for the last 15 minutes of baking. All that's left to do now is spray it with sealer. It will take about three coats of sealer, making sure that it dries between each coat. Simple and they make great Christmas gifts. This is my card for the skecth challenge at SCS today. You can see the details here. The stamp is by Sugarloaf Products and is about 12" long, but I just cut it for the middle section. 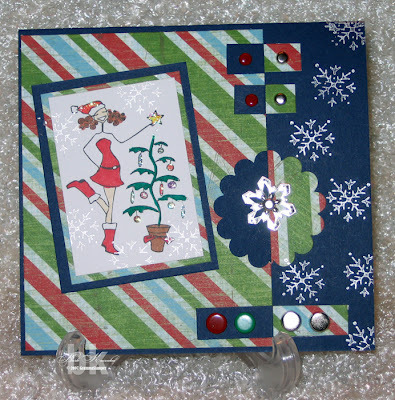 The layout was super simple, so the actual interest in the card depends on the embellishments one chooses. I wanted to use a non-traditional paper and I think the HOTP Winter Dots works just fine. The cardstock is Bazzill. I used some navy gros grain ribbon to define the upper and lower portions of the card. To the ribbon, I added a strip of Stampendous Glitter Snowflake Stickers and on the bottom, there are more of these stickers randomly set onto the card. I used Prismacolor Markers to colour the image, trying to keep the same colours that are in the patterned paper. The snow is covered in Frosted Lace Stickles which is just barely visible. Very simple, but very Christmasy, too! Sherry over at The Stamp Shack is hosting a swap which is to focus on the barnyard. While I don't usually participate in swaps much anymore because of the cost of the postage, I did want to do this one. I had an idea in mind and couldn't wait to get started. Well, this is nothing like my original idea and just proves, once again, that we improvise as we go along. Okay, it's totally changed from my original idea but there's a reason for that. I was blurfing not long ago and fell in love with a card I saw on Kendra Giles blog, Inkin' It Up, and I just had to CASE this card. I did change a few things like the stamps and the orientation of the card, but mostly it's a CASE pure and simple. I just had to do it and hope that Kendra believes that "imitation is the higest form of flattery". Here's my card for this swap. While this card is beautiful, (humble, aren't I)an amazing amount of work went into it. First, choosing the stamps was a trial in itself. I knew I wanted the scarecrow and cow, but I also wanted a sheep and a chicken, but it was obvious that unless I made a 12" x 12" card, it wasn't happenin', baby! Out went the chicken and sheep, sorry guys. With the stamps settled, I choose the patterned paper and from that, decided upon the colour of cardstock. To colour the images, I carefully scrutinized the pp so that I could pull the colours from there. So far, so good. Let me tell you, colouring seven images (I always make an extra for myself) puts a strain on these old eyes. Then I went back to Kendra's card and noted she had double-matted her main image. I couldn't because it was already just barely fitting on the pp. Looking closer I note the machine-stitching. Ladies, I'm no seamstress by any stretch of the imagination. I still keep my sewing machine manual beside me just to change stitches. And the zig-zag stitch will challenge me for the remainder of my natural life, I'm sure. I never get it spot-on, but this is my absolute best effort, if that counts for anything. I zigged-zagged around the blue mat onto the pp, then I had to change the stitch (see manual) and straight-stitched the white cardstock. Oh yeah, then I needed the photo corners and, without a punch, I had to improvise. I'm going to do a tutorial soon of how I accomplished this so you can all learn you don't need a dedicated photo corner punch. Next, I assemble the card and note I need a sentiment, too. That was easy. I just went to my Farm Faces stamp set and used one from there that fit perfectly. 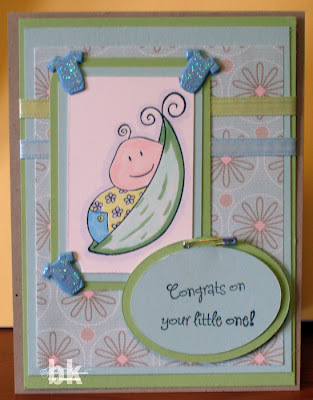 I used my small CM oval and used the green blade for the green paper and the blue blade for the blue paper, attached a couple of square brads and placed it on the card. Then out came the ribbon. First, I punched a hole in the card which caused some stitching to start unravelling. Quickly I applied Ranger Glossy Accents to the edges to stop it from further damage. 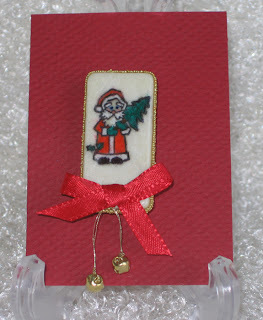 I decided to not do that again and knotted the ribbons first, then attached them to the card with Glue Dots. Even though it took a very long time from start to finish, about seven hours altogether for the seven cards, I love the way it turned out. It was well worth the effort. What do you do when your creative space is a mess? Currently, my space is so messy it is actually stopping my creative processes. I've been wondering lately why, when I get into my craft room, I can only make one or two cards and then I just walk away, very depressed because I'm not happy with what I've done. Yesterday, it hit me.....I can not think when the space is cluttered. That leaves me only one path to follow. I need to clean up my room. So, today is the day ~~ I'm going in and not coming out until I'm happy with my space. But first, I need to share what I did yesterday. I sat in there and thought about a card for Christmas that would be easy to make and could be done in assembly line fashion. This is what I created. I quite like it and will probably make at least a dozen of this type. It's really a simple card, but looks so elegant. There is very little involved and can be done in modules and then assembled in minutes. Last night, I attended a CTMH gathering at my LSS. There were two groups, one in the kitchen, one in the living room and the purpose was to demonstrate how you can make Christmas cards using alternative colours, not just red and green. The kitchen group made cards in shades of purple and lilac. My group went for the blues. I love this card, too and it also can be made enmasse. It's definitely another addition to my Christmas cards. I also learned how to make my own photo corners using a square punch. It's new to me and later today, I'm going to add a tutorial to my blog. I'm probably the last one to know this secret, but I'm going to show it anyway.